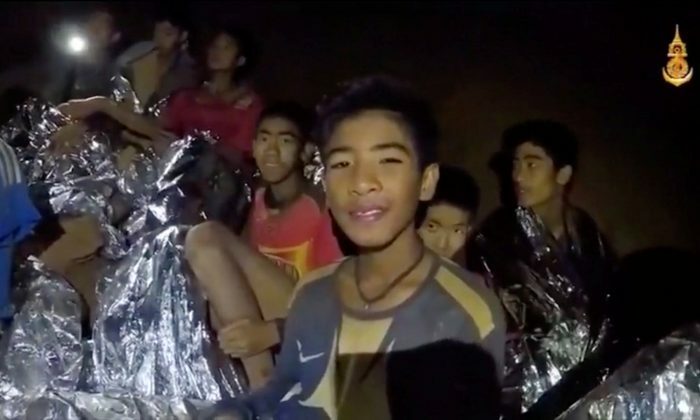 Parents of the Thai boys trapped in a flooding cave slept at the rescue site, according to reports, as teams prepare to continue their rescue effort in the morning. Officials said that four of the schoolboys were rescued over the weekend. The mother of one of the boys said she’s sleeping at the cave site as she waits for confirmation that her son was pulled from the cave. Twelve children between the age of 11 and 16 and a soccer coach had been trapped inside for more than two weeks. Officials have not yet named the boys who were rescued, not even to the parents of the group, according to Namhom Boonpiam, the mother of one of the boys. She’s the mother of Mongkhol Boonpiam, 14, who was named by Thai media as one of the children freed, The Guardian reported. “I just heard his name, Mongkhol, and I was happy enough,” she said. I believe he will survive,” his mother said. The four boys were given health checks before they were taken to the hospital, officials said earlier in the day. Narongsak Osatanakorn, the official in charge of the rescue effort, said Sunday that it was “D-Day,” adding that 13 foreign and five Thai divers were partaking in the rescue. The operation started at 10 a.m., saying that it would take hours for the first person to be rescued, according to The Associated Press.